Also serving communities of Bexley. There are 42 Assisted Living Facilities in the Columbus area, with 27 in Columbus and 15 nearby. The average cost of assisted living in Columbus is $3,523 per month. This is higher than the national median of $3,346. Cheaper nearby regions include Worthington with an average starting cost of $3,438. To help you with your search, browse the 296 reviews below for assisted living facilities in Columbus. On average, consumers rate assisted living in Columbus 4.0 out of 5 stars. Better rated regions include Grove City with an average rating of 4.7 out of 5 stars. Caring.com has helped 13 families in Columbus find high-quality senior care. To speak with one of our Family Advisors about assisted living options and costs in Columbus, call (855) 863-8283. Columbus, located along the Scioto River in Ohio, hosts the largest single breed horse show in the world every year in October, an event that's looked forward to by the 787,033 residents who call the city home. Of those residents, more than 67,000 are seniors, some of whom may need assistance with daily living activities. There are 27 assisted living facilities in Columbus to support and assist those seniors. In Ohio, including Columbus, assisted living facilities are called Residential Care Facilities (RCFs) and are governed by the Ohio Department of Health. The Columbus area is home to world-class medical facilities, including Riverside Methodist Hospital and The Ohio State University Wexner Medical Center, in the event of medical emergencies or illness. The Central Ohio Transit Authority (COTA) operates the city's public bus system. Seniors who are 65 years or older can apply for a Reduced Fare Senior ID card. Columbus is a member of AARP Network of Age-Friendly Communities, meaning that its elected leadership “has made the commitment to actively work toward making their town, city or county a great place for people of all ages,” according to AARP. Ohio, including Columbus, does not tax seniors on social security benefits, however, pensions are partially taxed and retirement savings account withdrawals are fully taxed. Seniors on fixed incomes might want to keep these tax laws in mind when relocating to Columbus. The cost of living in Columbus is 90.4, almost 10 points less than the national average of 100. Healthcare is also lower than the average at 89. Area seniors may find that the lower cost of living results in more money to put toward their facility expenses. Columbus residents enjoy all four seasons with summer highs of 85 degrees and winter lows dipping down to 20. The city also gets 40 inches of rain and 22 inches of snow each year. Seniors who enjoy watching the seasons change might like living in Columbus. Assisted Living costs in Columbus start around $3,523 per month on average, while the nationwide average cost of assisted living is $4,000 per month, according to the latest figures from Genworth’s Cost of Care Survey. 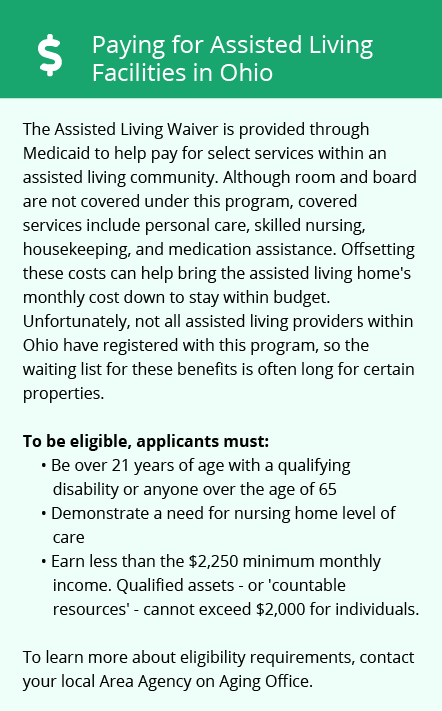 Seniors living in Columbus may qualify for one or both of the state's financial assistance programs, which help seniors pay for the cost of residing in an assisted living facility. 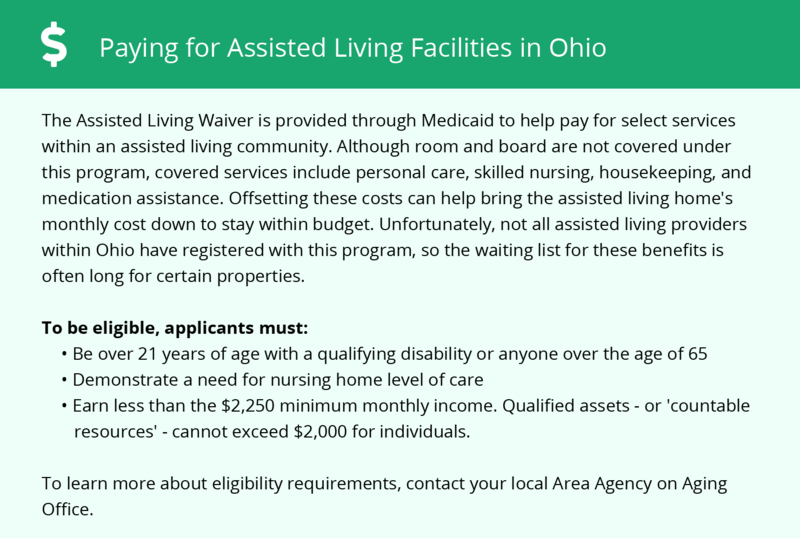 The two available programs — the Nursing Facility Level of Care Waiver, which is part of the state's Medicaid program, and supplemental SSI payments — are officially run by the state of Ohio. Columbus residents can apply through the Franklin County Department of Job and Family Services Office. To see a list of free assisted living resources in Columbus, please visit our Assisted Living in Ohio page. Columbus-area assisted living communities must adhere to the comprehensive set of state laws and regulations that all assisted living communities in Ohio are required to follow. Visit our Assisted Living in Ohio page for more information about these laws.